Package - 90 tablets in carton. Unique formulation with natural prebiotics. Universal action with therapeutic and long-acting preventive effect. Rare natural ingredients providing excretion of toxins and wastes. Wide range of formulations for animals of all ages and physiological status. 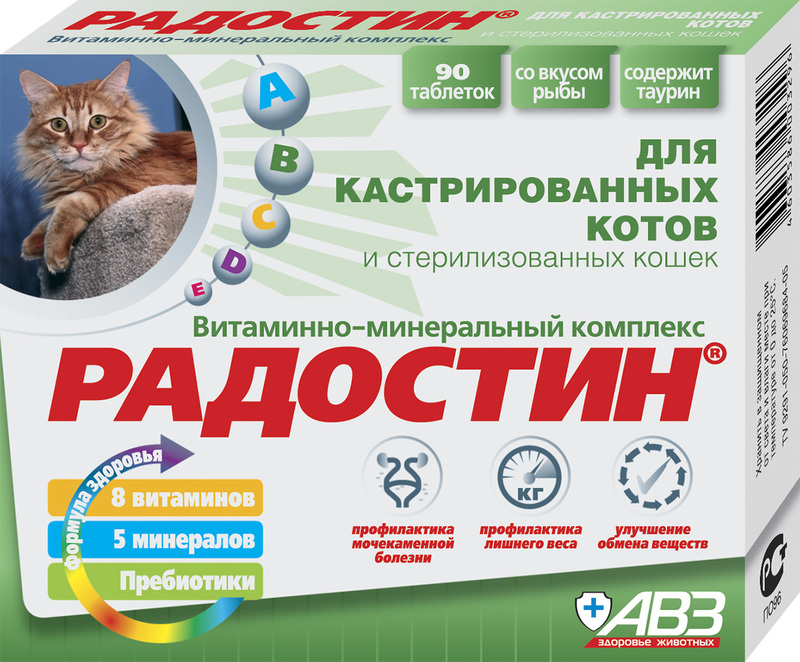 Radostin vitamin-mineral complex for dogs and cats is a combined drug with vitamins, macro- and microelements in physiologically balanced proportion, thus, providing the highest efficiency. 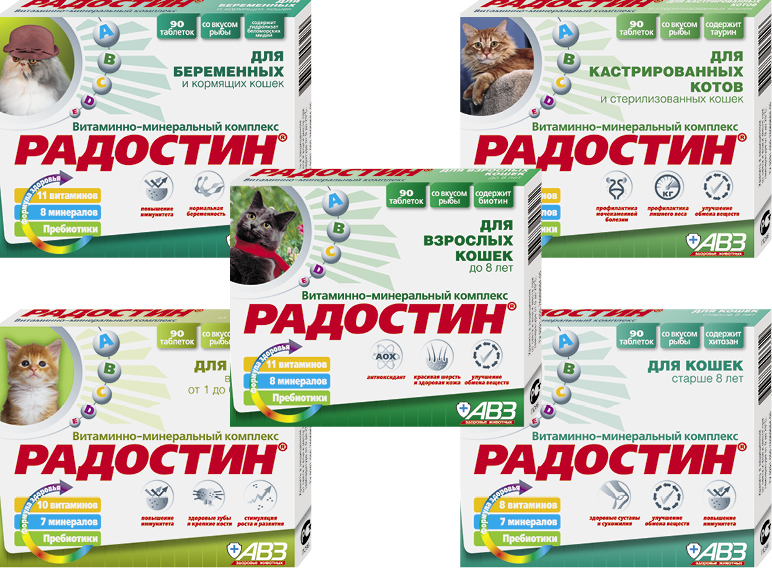 Radostin contains biologically active substances, unique prebiotics normalizing digestive processes; chitosan (original ''transport'' to deliver essential substances to organs and tissues); White Sea mussel hydrolysate enhancing organism resistance against dangerous environmental exposures; taurin regulating nervous system activity and providing retinal integrity. 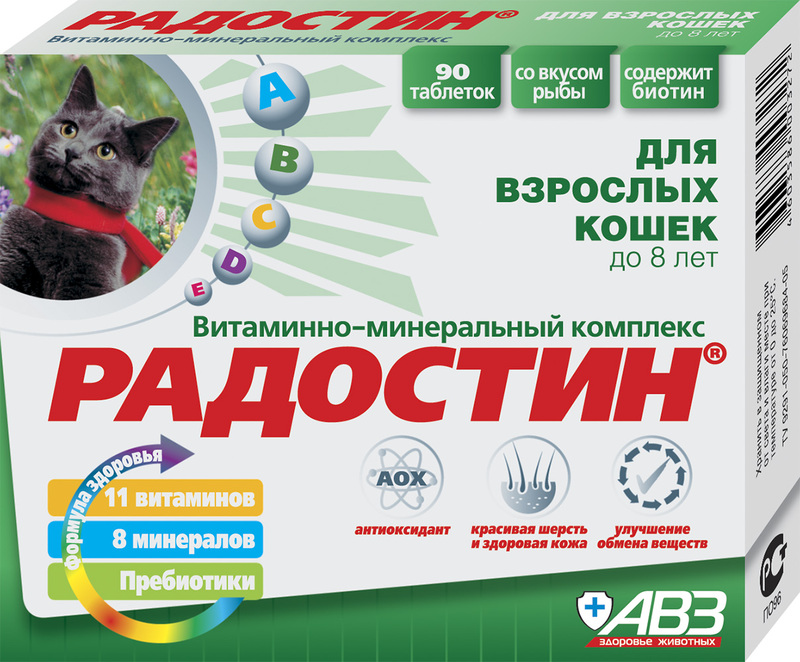 The drug provides synergistic effect on canine and feline health presenting metabolism normalization, prevention of vitamin-mineral impairment and associated diseases. Radostin increases life tonus and disease resistance. For metabolism normalization, prevention of vitamin-mineral impairment, increase in resistance against various diseases and stress, support and recovery of reproductive function, improvement of pelage and skin status. Metabolic disorders, hypovitaminosis, mineral impairment and associated diseases; for organism resistance enhancement, optimization of puppyish growth and development, adequate formation of osseous tissue and teeth, enhancement of muscles and tendons, improvement of gastrointestinal tract activity and appetite promotion. Metabolic disorders, vitamin-mineral impairment and associated diseases; for locomotor apparatus enhancement, joint mobility support, gastrointestinal tract activity stabilization, pelage and skin status improvement; for prevention of diabetes. 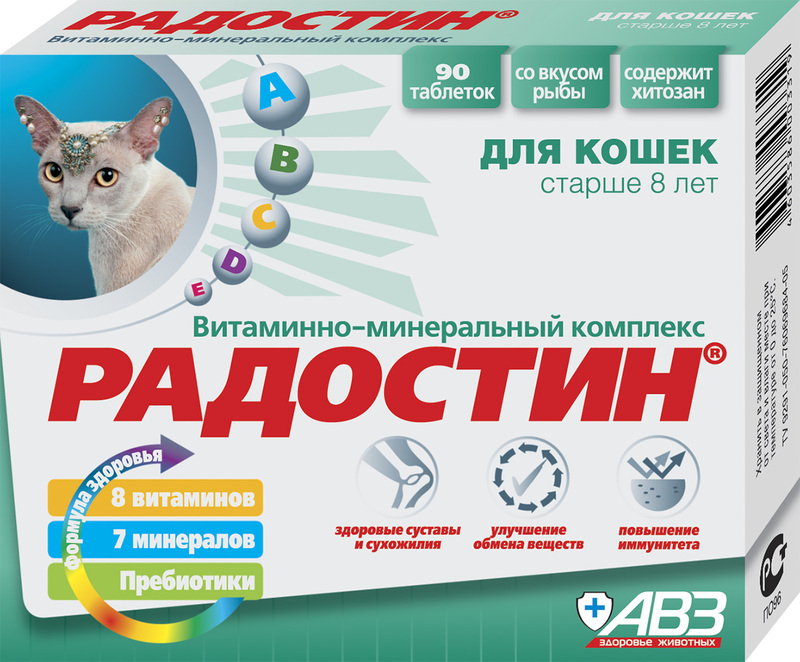 For organism resistance enhancement; in metabolic disorders, impairment of vitamins, macro- and microelements and associated diseases; for support and recovery of reproductive function, improvement of skin and pelage status. Metabolic disorders in the setting of vitamin-mineral impairment and associated diseases; for locomotor apparatus enhancement, joint mobility support, gastrointestinal tract activity stabilization and appetite promotion, pelage and skin status improvement, vivacity support. 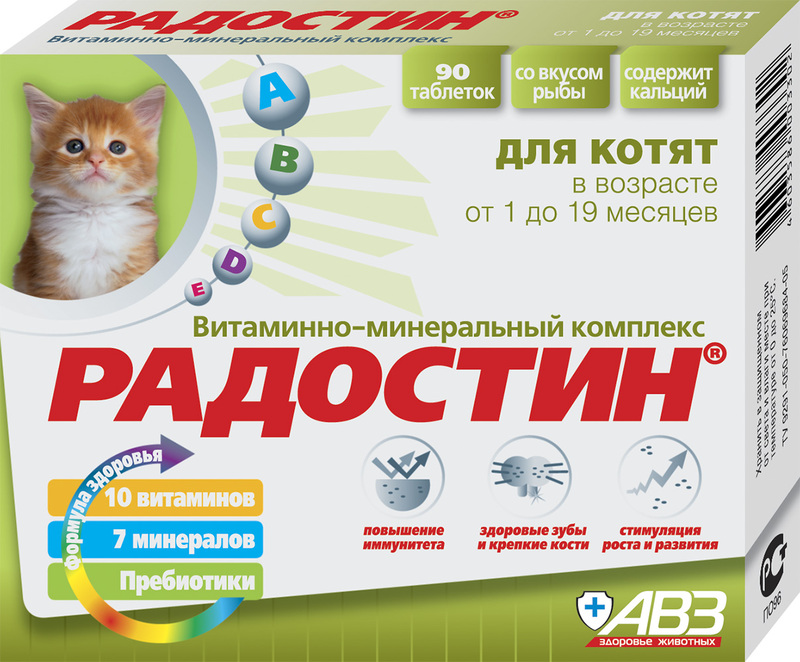 Feline metabolic disorders, vitamin-mineral impairment and associated failures of pregnancy, delivery, puerperal and lactation periods; for reduction of embryonic mortality and increase in viability of newborn kittens. 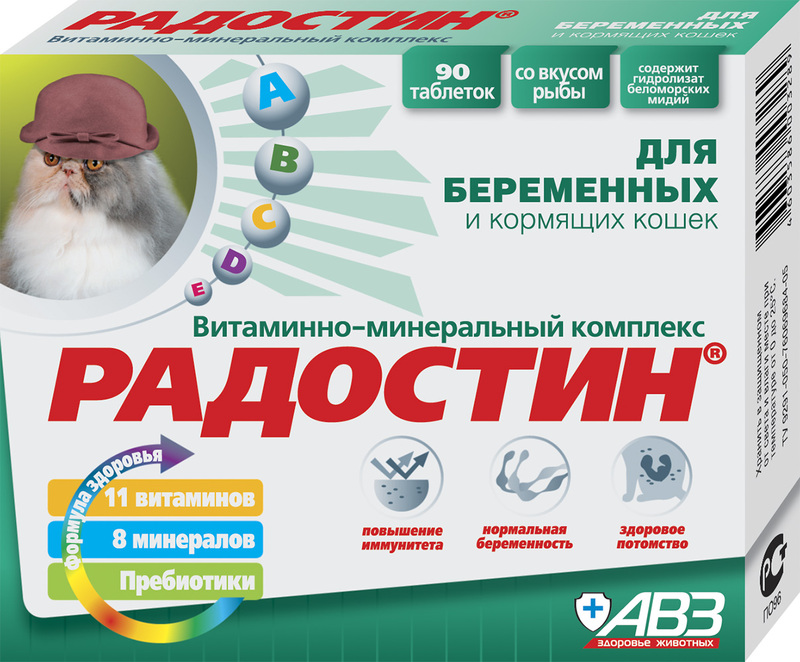 Metabolic disorders, hypovitaminosis, mineral impairment and associated diseases; for organism resistance enhancement, optimization of kitten growth and development, adequate formation of osseous tissue and teeth, enhancement of muscles and tendons, improvement of gastrointestinal tract activity and appetite promotion that is very important in period of intensive growth and development. To reduce rehabilitation period after surgery, normalize metabolism in neutered cats, enhance organism resistance against environmental adverse factors; prevention of overweight, obesity, urinary stone disease, vitamin-mineral impairment and associated diseases.